We just held our fall board meeting here at RHM, and we are super excited as we consider potential locations for our new self-hosted events in 2018. As we ponder the things that are transpiring around the U.S. presently, we are impressed again of the need for Renewed Heart Ministries’ work. RHM edifies and educates. Our focus is on helping Christians discover the intersection of their own faith in a God of love and the work of social justice. We believe that Christians in the west are especially in need of rediscovering the teachings of Jesus and how those teachings implore us stand in solidarity with those being oppressed, and to work along side those communities toward systemic change. The Hebrew prophets did not call for charity. They called for justice. They did not call for temporary, bandaid solutions, but for systemic change. As Emilie Townes so eloquently states, “When you begin with the belief the God loves everyone, justice isn’t very far behind.” We help people discover how to concretely impact the suffering in our world. This fall will determine how much we are able to do in 2018. We are asking for 500 people to support these new events with a donation of $25 or more each month—for one year! With your support, we’ll be able to work where people can be challenged, changed, inspired to make a difference in communities we wouldn’t typically be able to reach. These events will continue to be free of charge. Freely we have received, and we want to continue giving freely too. For RHM, these new self-hosted events will cost us more than our traditional seminars. Instead of relying on organizations to commit to covering our travel expenses and host us, with our new self-hosted weekends RHM will have to cover travel and space rental costs ourselves. This is where you, as one of our 500 people, will be able to help. 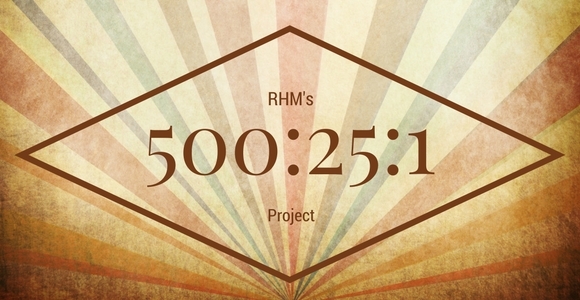 We’ve already had a tremendous response to 500:25:1 project. We are just over 1/5 of the way to our goal of 500 people. Thank you to each of you who have already signed up! If you have not yet done so, can we count on you to be one of 500 folks who partner with us for 500:25:1? Also, if you’d like to have RHM come to your community, you can also request a weekend of teaching in your area TOO! Let us know if you’d like RHM to host a weekend in your town and we’ll add it to the calendar! Thank you so much for helping us to take this next step!